Caught between eastern and western Europe, Budapest has a character uniquely its own. It's also the last cheap, civilised city in Europe. Budapest can seem like one big sight, with each phase in its history, from the Ottoman period until the Communist days and from renaissance to revolution, leaving its mark on the city. For the tourist, a trip to Hungary's capital is dominated by the majestic sights of Buda. In the summer, there are open-air festivals at Szeged, Diosgyor Castle in Miskolc, Gyor and Pecs. Visit the former Royal Palace complex, the Matyas templom and the Belvaros. Margaret Island is a giant recreational park and feels pleasantly separated from the city bustle. Hungarian National Gallery houses Hungarian art since the birth of the nation. Although Esztergom is Hungary's most sacred city, home of the Archbishop and the nation's biggest church, it has a real-life edge. The first-time visitor to Szeged is invariably struck by its space and grandeur. One's immediate impressions of Hungary's third largest provincial city are of greenery and plazas, of broad. Bratislava is Slovakia's capital and largest city. The Carpathian Mountains, which begin at the Iron Gate of Romania, finally come to an end here. Vineyards on the slopes of the Little Carpathian Mountains meet the Danube River. 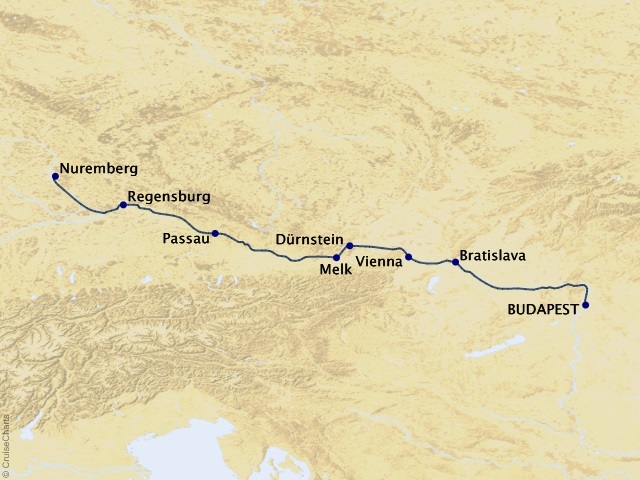 The Austrian border is almost within sight of the city and Hungary is less than 15 miles away. Many beautiful monuments survive in the old town to tell of its past under Hungarian rule, and Bratislava's numerous museums are surprisingly rich. Franz Lizst visited Bratislava 15 times, and the opera productions of Slovak National Theatre rival anything in Europe. The old city, which is packed with museums and palaces, and the castle are the best parts of Bratislava - the rest of the city is pretty drab. Climb up the castle for great views and to check out the very interesting Museum of Folk Music within. The Slovak National Museum and the Slovak National Gallery on the river are also worth a visit. Hviezdoslavovo námestie (square) is a convenient orientation point, with the old town to the north, the Danube to the south, and Bratislava Castle to the west. Vienna is dominated by imperial castles and places: Schonbrunn, the magnificent summer residence, the Imperial Coach Collection, the Palm House, the Butterfly House, Belvedere Palace, magnificent state rooms in Hofburg, and the imperial crown in the Treasury. Stop by Ringstraße - the showplace of the monarchy built where Emperor Franz Joseph ordered the demolition of city walls. Important buildings include the State Opera, the Museums of Fine Arts and Natural History, Parliament, City Hall and Vienna University. The world capital of music. A long line of great composers Johann Strauss, Haydn and Mozart, Beethoven and Schubert, Mahler and Schonberg all worked here. A city with splendid concert halls, such as the Golden Hall, from which the Philharmonic's New Year's Day concert is broadcast annually. International stars love to appear here in the State Opera, Volksoper, Konzerthaus, and at festivals like the Vienna Festival, the Klangbogen concerts during the Musical Summer, the Jazz Festval and the Haydn, Mozart and Schubert festivals. Here in the heart of the beautiful Wachau wine region where vineyards lace softly rolling hills lies Durnstein. See the ruins of Kuenringer Castle where Richard the Lionheart was reputedly held prisoner. Visit the former Collegiate Church. A stroll through medieval cobblestone streets reveals old burgher houses, wine taverns and quaint 16th and 18th century townhouses. Enjoy a wine tasting in one of the many charming taverns. Gateway to the Wachau valley, Melk is world renowned for its magnificent Abbey. One of the most splendid examples of Baroque architecture in Europe, the Abbey dominates the town from high above the Danube river. Admire the splendour of the famous Melk Cross, the Abbey library and the Collegiate Church. In the third millennium, Passau was considerably enlarged by the prince bishops of Passau, who made it their royal residence and capital of the largest Danube diocese. The wonderful Baroque buildings dominating the city today were built after a fire of 1662. One of the most striking is cathedral of St. Stephan, with the world's biggest church organ. One of the best ways to enjoy the magic of Passau is with a sightseeing tour. Other sights to see include: Neue Residenz - an Episcopal palace; Veste Oberhaus - Citadel of the prince bishops with the best view of the Old Town and confluence of the three rivers; Town Hall, which is lavishly decorated halls with monumental paintings; Niedernburg Abbey - tomb of Gisela, first queen of Hungary; Maria Hilf - an abbey and place of pilgrimage overlooking the town center; Dreiflusse-Eck - the confluence of the Danube, Inn and Ilz; and St. Nikolai - a University church with Romanesque crypt. Regensburg is located in Bavaria, one of the most distinctive regions of the entire nation. It is an ancient city. Settled first by the Celts in prehistoric times, it was a Roman center for centuries and the site of an important bishopric in the Middle Ages and after. Regensburg is now a thriving city of approximately 150,000 and is a major port on the Danube with beautiful and well-preserved architecture as well as striking, modern buildings. It is only a short distance from both Munich and Nuremberg and within easy access of Vienna, Prague, and other major centers of Central Europe. The second largest city in Bavaria, Nuremberg is a glowing testament to medieval culture as evidenced in its historic monuments, Gothic churches and elegant patrician houses. Take a walk around the 13th-century city walls, complete with moats, watchtowers and gateways. Then experience "shopping" as it was in the Middle Ages at the Handwerker Hof, a charming "mediaeval mall". Don't forget to sample the city's famous Bratwürste annd Lebkuchen. Rates are cruise only or cruise/land (where applicable), per person, based on double occupancy. Port charges of $182 are additional for all guests. Rates are cruise or cruise/land only, per person, based on double occupancy. Port charges are additional. No additional government fees/ taxes or fuel surcharge. No fees for the rate of exchange US$-EUR.